The term 'contre-jour' means 'into the light'. 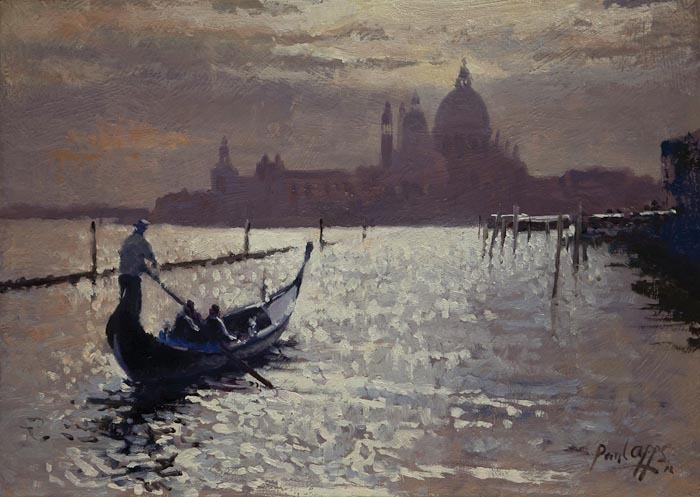 I came across an article by Paul Apps in which he explained how he did a contre-jour painting in oils of Venice. 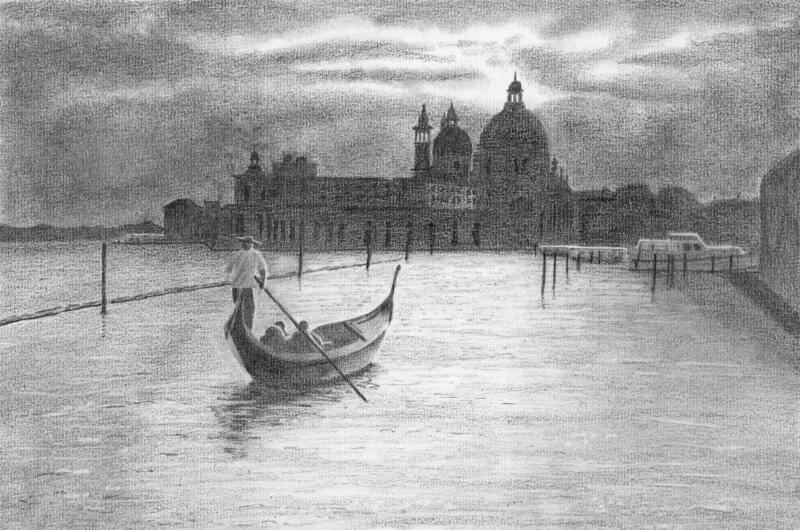 I was very interested in trying this in pencil as, in my opinion, graphite is underrated and underused for landscape and seascape work. Paul happily gave his permission for me to use his painting and I have a clear vision in my head as to how I want the finished drawing to look. I made a simple start by sketching out the outlines of the main features. 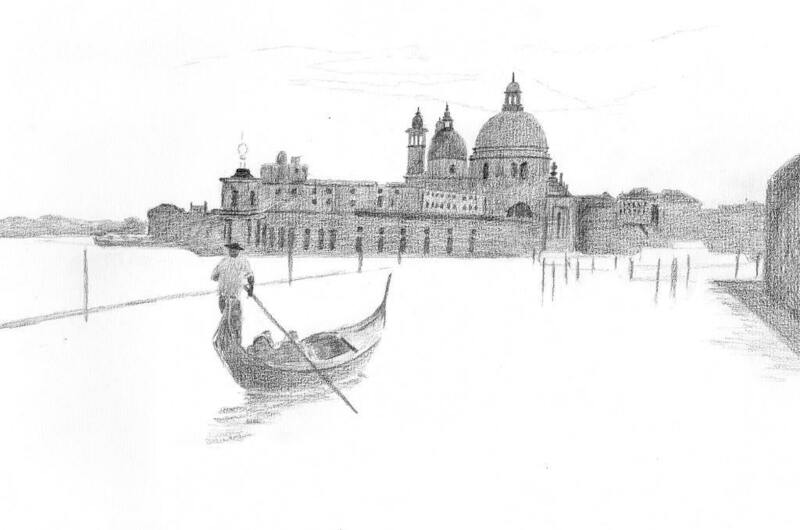 The distant buildings aren't quite horizontal enough but I'll correct that as I go. 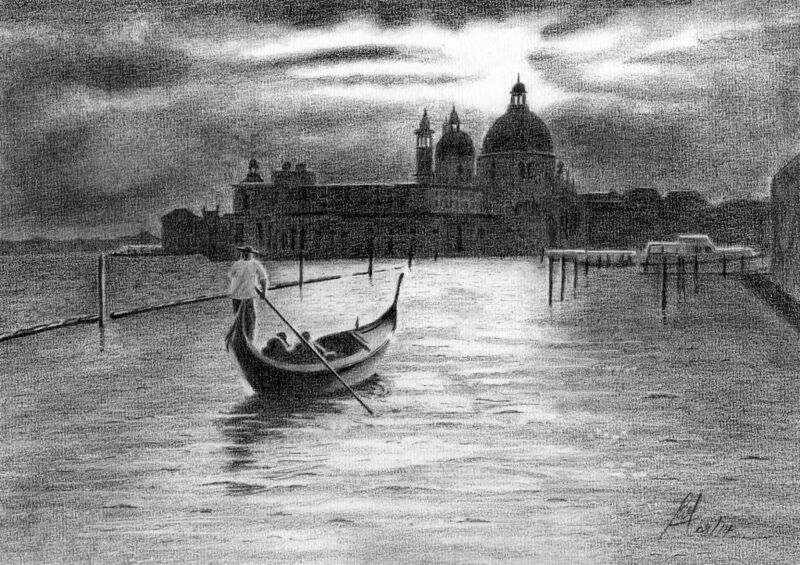 Using an oil painting term, I've blocked in the distant buildings and the darkest tones of the Gondola. I know I've got to go a lot darker than this to get the 'light' that I want in the final picture, but I don't want to just have a black silhouette ... I want to retain some of the detail, even though it may not be much. I'm going to block in the sky next so that I can start to get a feel for how dark those buildings will need to be. I've put in the sky now, though I will probably return to it later depending on how it looks as the rest of the picture comes together. I've deliberately left the central area as white paper as I want to achieve a strong sense of brightness. I may tone it down a bit later. 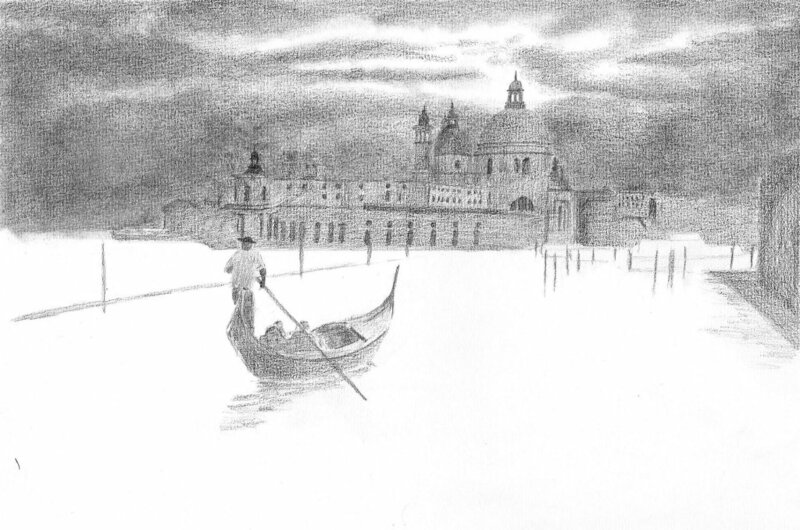 The sky was achieved just by scribbling in some mid tones, then laying in some darker areas, and then blending. I used the blender in a circular motion to give the impression of clouds. and I lightened a few areas by dabbing with Blu-tack. I wanted a dark sky in order to create the light but as you can see, I've now lost some of the buildings, especially on the far left. Now I've got a much better idea of how dark I need make them. I've darkened the buildings so that they stand out against the sky again. At this stage it's easy to think I've made everything too dark, but I keep telling myself I won't get the 'light' I'm looking for any other way. What I have in my minds eye has to be the very last stage and it will either make it, or break it. 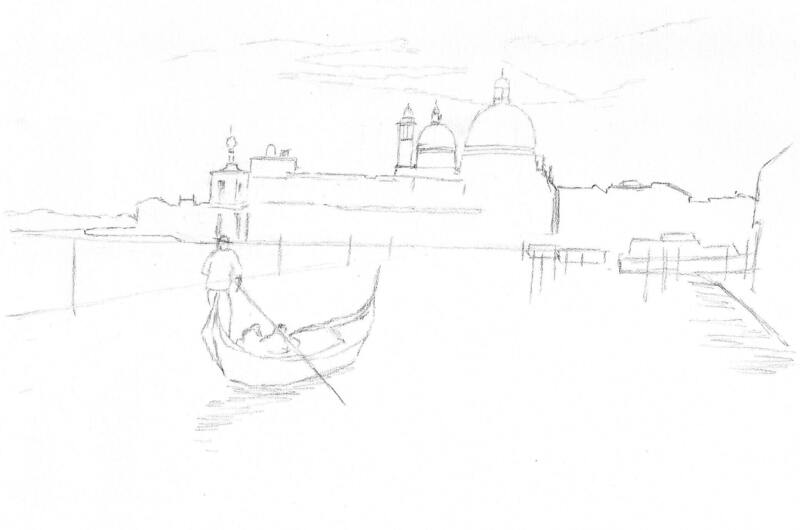 I've now refined the Gondola, added a couple of boats in the middle ground, and the mooring posts. I've also laid in my first layer of water as I wanted to get a feel for how it's going to look. I think this will be the hardest stage and I want to build it up bit by bit. 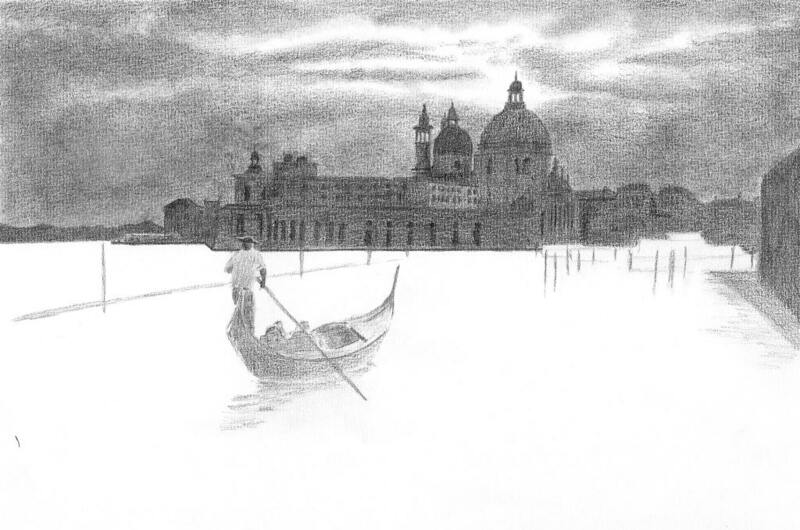 I've now worked over the water again, adding ripples and wavelets, and bringing light shading into the middle area. I've darkened the water in the far distance and in the shadow areas on the right. And this stage shows that things don't always turn out as we imagine them. Since the moment I first decided to draw this, I've had a clear image in my mind's eye as to how I wanted it to look. I've finally taken the drawing to that stage .... and it just doesn't work the way I'd imagined it would. There's something about those sunbeams that makes this look less like twilight and more like a Divine Intervention. It just doesn't look right. 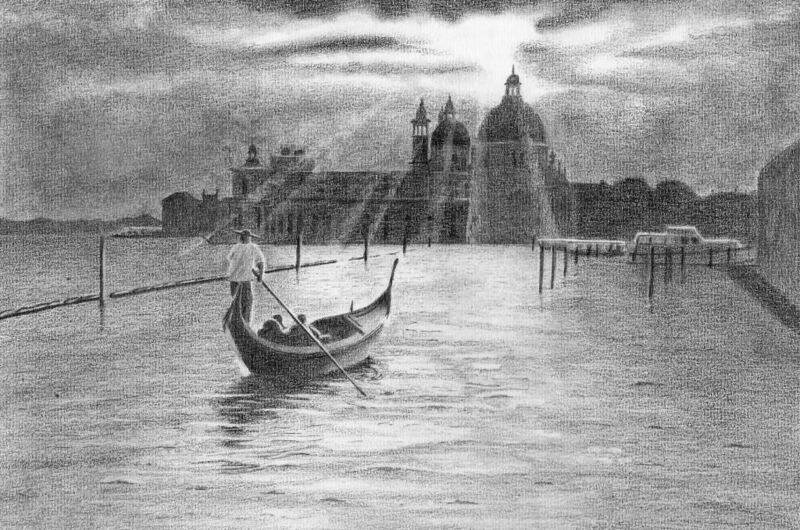 With some careful use of the pencil and blender I've managed to remove the sunbeams and correct the picture. I think I prefer it this way. The rays of sunlight were just a step too far in my opinion. Not saying this is finished yet but I'll put it to one side for a day or two and then have one final pass over it. I neededn't have included the last two steps in this WIP but I wanted beginners to realise that all is not lost when something goes wrong. I've decided to call this finished now. 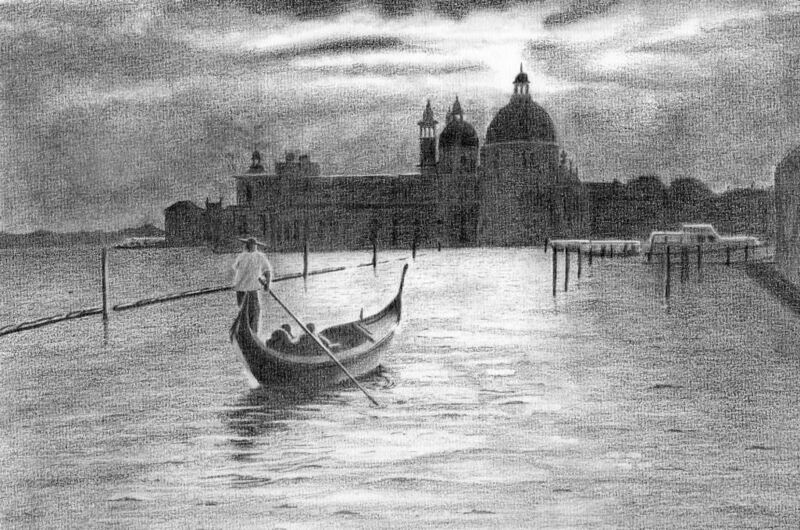 I've darkened the buildings a little more, added some darker tones to the side areas of the water, added a few more darks to the sky in places, and put in a couple of extra highlights here and there. 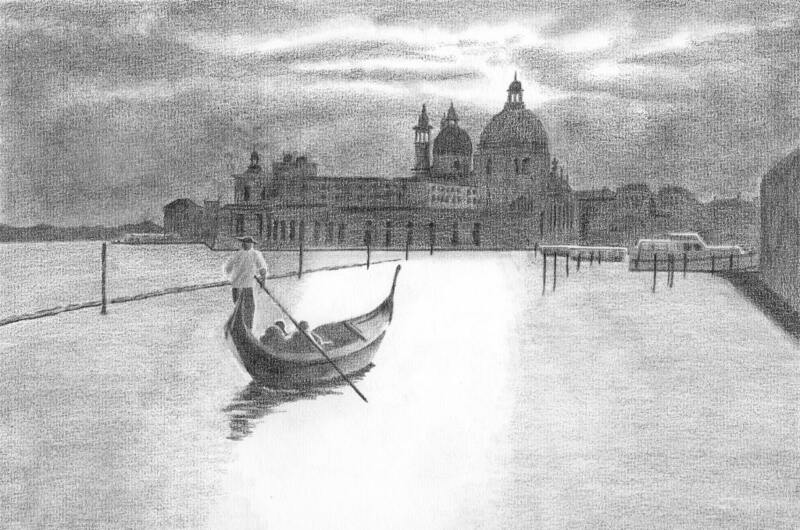 I've also worked over the Gondola just sharpening up the edges and putting in a little extra contrast. It's time to call it a day and stop fiddling.